Short Description: NARA A3355. 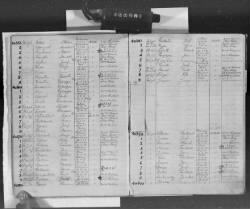 Lists and Registers of German Concentration Camp Inmates, compiled 1946-1958, documenting the period 1942-1945. Short Description: NARA T1021. 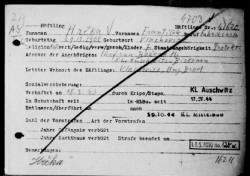 German documents predating May 8, 1945, found among the War Crimes Records of the U.S. Judge Advocate Division, Europe. Long Description: Four volumes containing handwritten lists of inmates of Flossenbürg Concentration Camp.